Want to find our more about us? ........ just read on to see who does what within the Society. Jeff brings with him a wealth of talent that will ensure that we continue in our development as a strong musical choir. 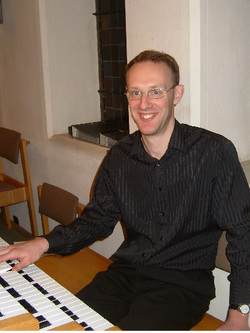 Our rehearsals would not be complete without the services of Colin Spinks, our Accompanist. Colin offers us further encouragement and support, and just seems to know if a voice section needs a little more help during rehearsal. Press the button, below, for further details of Colin's career. We could not exist without the hard work and commitment from our Committee. Press the button below to find out who is who on the Committee.